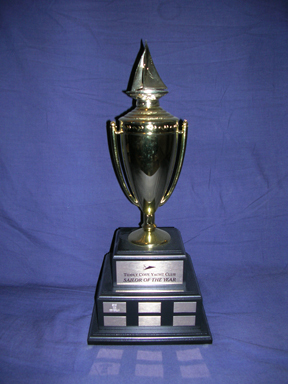 The Sailor of the Year Cup is awarded annually to the sailor who turns in the best performance over a trio of diverse sailing challenges including a regatta race, a single-handed race and a double-handed long-distance challenge race, with each individual event run in any boat of the sailor’s choosing. The trophy was inaugurated in 2010, coinciding with the first year the Sailor of the Year challenge was held. Sailor of the Year competition is open to all TCYC members and registration is not necessary but please inform the Race Committee prior to the race if you intend to race single or double-handed. One race in each crewing category must be completed to be in contention (if contenders compete in more than one race in any crewing format the best result will be used). Results for Sailor of the Year will be scored on the low-points system, using PHRF handicaps with no division breaks. Contenders can use different boats for each race (borrow a Cal 20 for Passage Island, get a Martin 242 lined up for the round-the-buoys action, and get aboard a well-equipped Beneteau for the Scramble!). Of course, you could also do it all on one boat, and then if you were really brilliant you might be able to win Fleet Champion Boat and Fleet Champion Sailor!